Oooohh but we can’t forget the Tassle Earrings! So far this year I have seen so many dark shades used for 2017’s SS wear. Laurent really seals the dark SS deal with a majority BLACK collection. With predicted dark times ahead a dark SS17 collection feels right on cue! The collection kicked off with a love heart v neck dress, the beautiful cut it had from the shoulders right down to the point really grabbed my attention. The cut was repeated throughout the collection. Leather upon Leather! Even Leather with Denim! Single Sleeves also seem to be a trend that will be making a re-appearance since its last boom back at the beginning of the millennium. when i first started to see the single sleeve re-emerge I wasn’t a fan, but if it is presented like the single sleeves from the Saint Laurent Collecting then I am all on board. As seen above is the SEE THROUGH!!! Blouses. The images speak for themselves. i have always been a fan of this look in magazines on catwalks, so for me again its another winner look, very edgy! 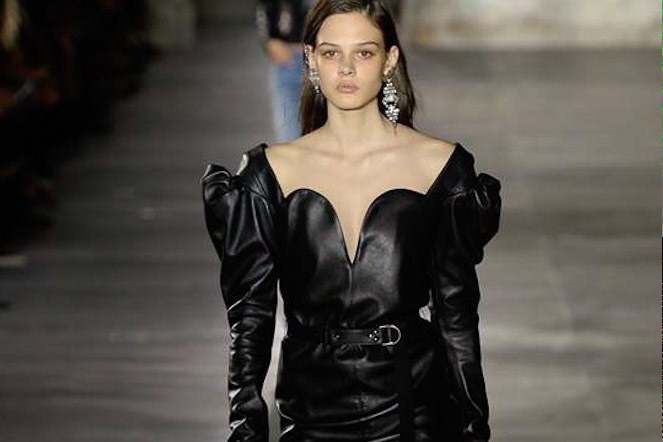 The Collection was stunning, I look forward to see what Anthoney Vaccarello (the new Saint Laurent) designer brings next! Every piece was individually stunning, but yet the whole collection worked together and told a story. its been a long time since we had an all black Spring Summer collection, as a person that loves black, it works for me!